Vehicle safety is an important aspect in the designing of a car. So Crashworthiness is commonly tested when investigating the safety of the vehicles. Crashworthiness is the ability of the structure to protect its occupants during the crash event. There are various different types of impacts occurs every day throughout the globe. 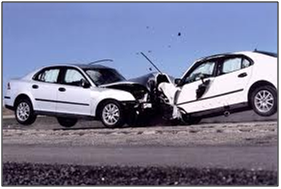 So depending upon the nature of the impact, may be either front or side or even rear, the occupant within the vehicle should be protected. Depending upon the type of the impact, type of the vehicles involved, different criteria’s are applied to judge the crashworthiness and to analyze the safety of the vehicle. Echelon has helped their clients in developing a full vehicle integration work, including various sub-assemblies like biw, engine assembly, bonnet assembly, head light assembly, IP assembly, bumper assembly etc. precisely. For vehicle integration Echelon has expertise in carrying out this preprocessing work using either Ansa or Hypermesh in the different explicit solver format. Echelon has done the deck preparation work in LS-Dyna format, Pam-crash format as well as Abaqus-Explicit format. Along with this Echelon have expertise for carrying out status model work, simulation work as per different load cases and FMVSS, ECE regulations. Echelon has expertise in doing the assembly – full vehicle integration work including subassembly level model update work required frequently for Crash analysis. Along with this we have expertise for carrying out status model work, as per different (FMVSS, ECE) regulations. 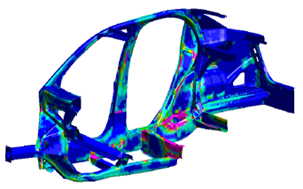 Our team of expertise have done the full vehicle integration work required for crash analysis for different solvers like LS-Dyna, Pam-Crash and Abaqus Explicit. We have executed seating system simulations as per European regulations. We have done the model build work for frontal impact simulations at offshore. We have expertise who carried out some of the following simulations at our client locations. Full frontal Impact as per US-Ncap regulations. Offset Barrier Impact as per Euro Ncap regulations. Side Impact as per IIHS Barrier. Corner impact as per IIHS standards. Frontal impact - Pendulum Test.